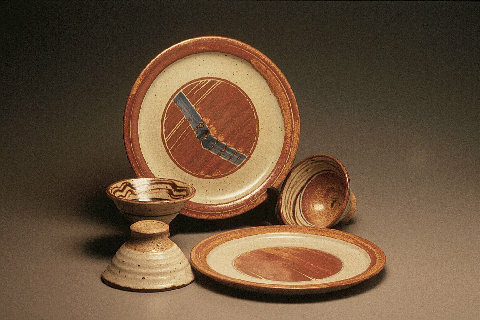 1866: "Roller applied to edge"
1867: "Roller squeezes clay up into wall"
1868: "Roller turns wall flat"
1869: Metal rib for even smoother finish"
1873: "Placing disc in center"
1872: "Pressing clay onto disc for very flat bottom"
"My method of displacement trimming allows the wirecut area to remain available for glazing, and builds up a foot from the slight excess clay left from throwing. There is no waste to recycle. 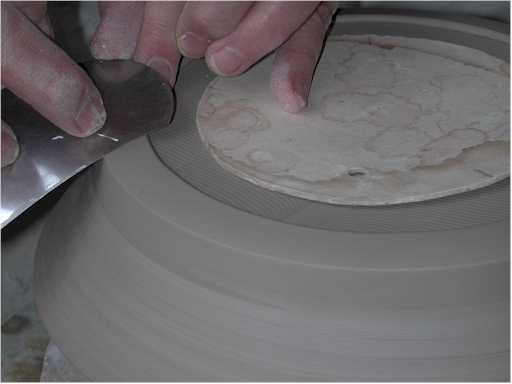 Precise drying of the pots is critical to success with this method. I warm my studio with a mix of passive solar (showroom/solarium) & electric infrared perimeter units to avoid drafts; and the pots are dried on two 4' by 10' canvas-covered tables. 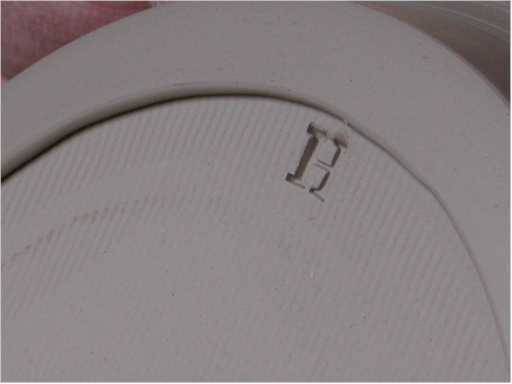 "Alterations to the plate rims occur around four hours after throwing. 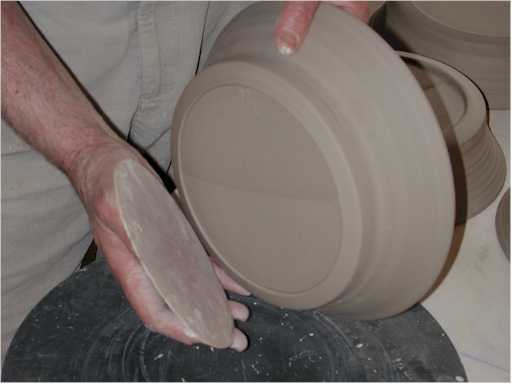 The pots are then wirecut from the bats, and the bats are later rotated midway through the drying process to insure even consistency of the pots around their bottoms. 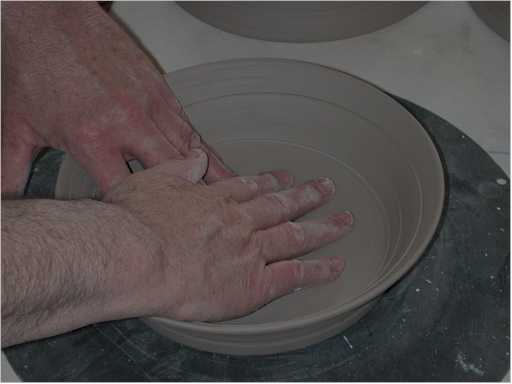 This last is a simple yet critical step if an even footring is to be formed by this method. 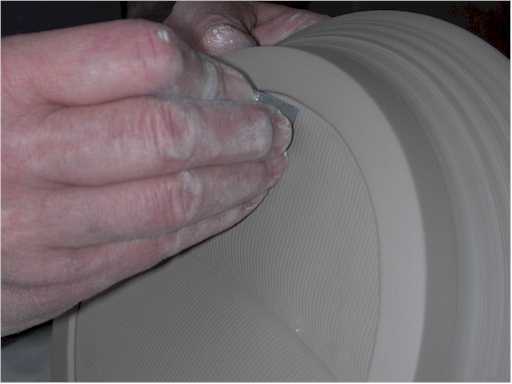 "Stiff upholstery-foam circles glued to bats support the plates when rolling a foot. 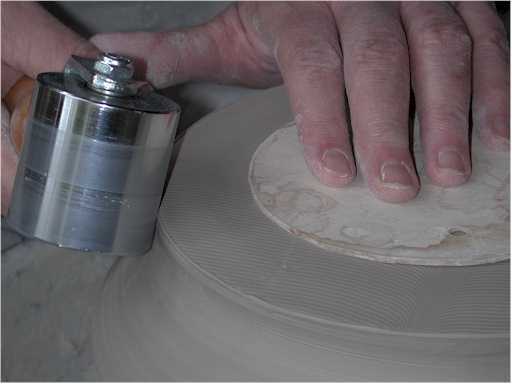 A disc of matboard is used to protect the bottom from the pressure of the left hand. 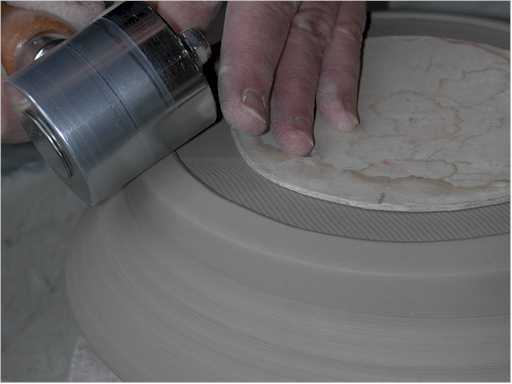 There is much less need to center the plate with this method, as one is not cutting the clay. 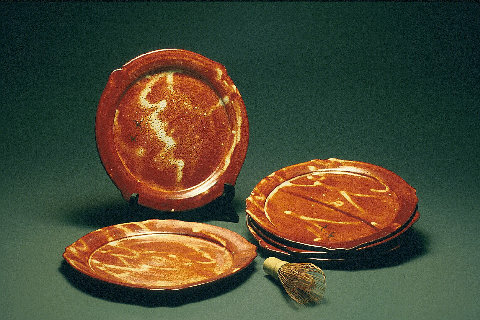 "After the bisque, the footring is waxed, an Avery label is placed in the center of the plate bottom to resist glaze, and is peeled off after glazing to permit use of a 'waddy' to keep the bottom from kissing the kilnshelf. "This method does require a pretty flat shelf, and with it I use a mix of Advancer and Crystar setters dusted with Alumina oxide. 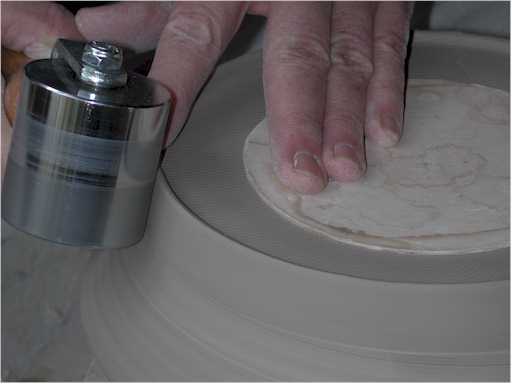 After the glaze firing, the footring requires only a light brushing of wet/dry emery paper to prevent the marking of fine furniture. 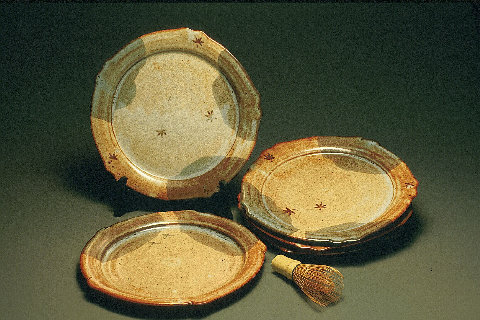 "And with so little bare clay exposed, it is a pleasure to pull these plates out of soapy dishwater." Note: To inquire about obtaining Hank's Roller please see Availability. Note: the WireTool Tutorial has many photos and will take a while to load.